Whether it's sandal season or not, dry, crusty skin on the bottom of your feet can be irritating and embarrassing. Walking in bare feet, or friction against the insoles of your shoes, both can contribute toward calluses and dry, crusty skin, but there's no reason you have to live with it. Although there are commercial products for foot care, you can use natural remedies to remove dry skin and keep your feet soft and smooth. Fill a foot bath with 2 quarts warm water. Add 1 cup of milk. 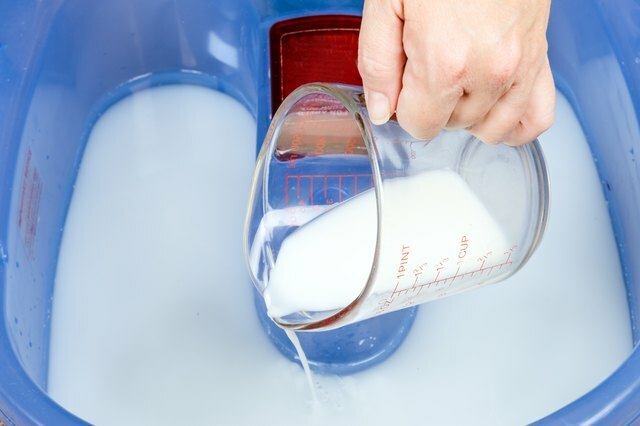 Soak your feet in the milk bath for 10 to 20 minutes to soften the dry, crusty skin and add natural moisture. Moisten a pumice stone with water. Lift one foot out of the milk bath. Gently rub the pumice stone back and forth over patches of dry skin and calluses to wear them away. Repeat this step on the other foot. Rinse your feet with warm water. Pat dry to remove moisture from the surface. Massage 1 tablespoon of olive oil into each foot, concentrating on the areas where dry, crusty skin exists. Gently rub your hands over the skin to ensure the entire foot is moisturized. Wear cotton socks while the olive oil is absorbed into the skin. If you do this at night, you can leave the socks on as you sleep. Substitute other natural oils for the olive oil, such as coconut oil or jojoba oil. In the absence of a pumice stone, use 1 tablespoon of coarse salt or brown sugar with 1 tablespoon of oil. Rub the exfoliating mixture over your feet for five minutes to remove dead skin cells and dry skin. When cracked feet don't respond to skincare and moisturizing, a foot fungus might be present. See a podiatrist for a professional opinion and recommendation.